Brass Connectors are manufactured from stainless steel, copper, brass, nickle plated brass, steel alloy and other material composition as per custom specification and requirements. Brass electrical Connectors are widely used for installing low and medium voltage conductors for different heavy and medium duty applications. The standard range of brass connectors provide excellent performance with different international global standards and specification. Brass Connectors are available in different coating and plating which includes Chrome, Nickle Plated Brass, Copper, Zinc, Steel alloy, electrolytic tin and more as per custom requirements. Available with Internal and External Threads. Available in Rugged, Sealed, Reliable, lightweight and compact design. Available with High tensile strength and pressure resistant. Provide high degree of safety. Provide reliable and durable performance in variety of connecting applications. Provide pressure tight sealing and connection. Brass Connectors provide easy installation and disconnection. Widely used in under water applications. Suitable for suction, pressure hoses and other connections. Widely used with multi core cables and other different kits. For Compressed Air, Water, Gases and Liquid. Widely used for connecting and terminating applications. Widely used in connecting or joining wires and cables in different junctions and multiple connections in electrification. 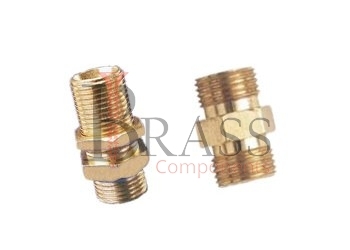 We manufacture Brass Connectors as per Custom Specification and export in Finland, Jersey, Spain, Switzerland, Ukraine, Austria and other European Countries. For more Information, Please Contact Us or Inquiry Now.